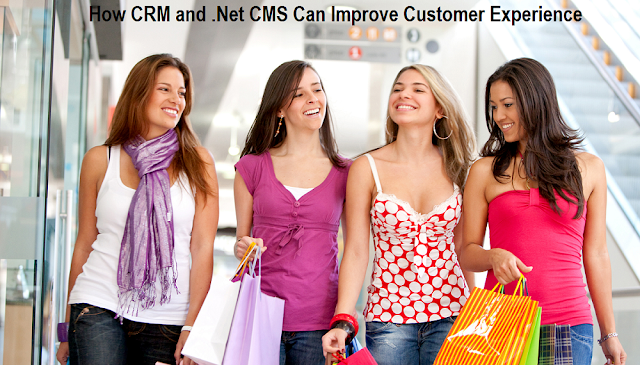 How CRM and .Net CMS Can Improve Customer Experience? The use of CRM in CMS platforms these days are seriously driving some great customer experiences and that what we have explained in this article. If you are serious about the use of CRM in your .net CMS then read on. Now if you have a business online, then you do not have a chance to have a face-to-face conversation with your customer. You cannot convince them with your sales pitch, but the only thing on which you need to rely is to lay down a better digital strategy so that customers get convinced even without a sales pitch. Rather than stressing more on your backend technologies, to drive better customer experience you need to put an extra little effort to the front end. However, both are critical aspects of your organization, and you need to assess their role from time to time and employ the best elements to support your business online. You might build a website on asp.net CMS, but if you do not implement the right set of tools then driving better experiences will be difficult. When you get down driving better customer experience, you need to understand the market opportunities. You have to carry out some surveys to understand your customer’s needs. They will help to demonstrate successful transformational change across the organization. It does not matter who is leading the effort to drive better customer experience in an organization. What matters is how you are executing it, are you employing the best practices, technologies, and culture. Therefore, a leader with skills to drive better digital experience will be critical, but through a proper technology, driving better customer experience is one of the best ways out. What is so different in having a digital transformation in your business compared to other enterprise programs? It is the growth and the survival strategy. Digital transformation targets the online businesses to mature with new digital capabilities leveraged to existing products to deliver amazing customer experiences. The integration of CMS platforms with a proper set of tools will stop making you generate peanuts and have some bigger share in ROI. Your potential prospects will get a gamut of options to select products, various services, and partners and can address them as per their needs. Remember, that products with simple experiences is going to deliver greater value and will be able to attract new prospects while the ones which drive poor experiences will likely lose new as well as existing customers. The digital transformation in your business begins simply employing a digital strategy. However, make sure that the strategy that you lay down must understand customer needs, identify all the target markets for your product, define various customer segments and build some out-and-out personas. Every persona helps to drive a specific user type with a number of needs, values, and expectations. The objective is to redefine the digital journeys for every persona that is able to demonstrate their needs separately and generate a better value. What Should Your Digital Transformation Path Look Like? The digital path might show the customers response to a social media campaign, reviews of interesting content that you have on your website or the requests when he fills out a form. You might meet a customer offline, who makes a purchase in your store and for technical support, he or she choose to be online. If you have implemented an underlying system like a CRM integrated into your .net CMS, then capturing the source of activity, metadata on content consumed and result of the actions taken – all such information comes out swiftly. This information helps to decide a persona and optimizes the follow-up, interactions, and experiences. How Will You Drive Digital Customer Experience with CRM, CMA Platforms, and Analytics? By integrating CRM in CMS platforms like WordPress, Joomla, Drupal, etc. triggers a journey pattern through a number of marketing activities that flows through the corporate website. How it directs towards the sales pipeline, how the technologies such as marketing automation platforms, CMS platforms, analytics platforms and CRM are some of the core systems that most enterprises need to invest to drive some better results. In a survey, it is shown that 25 percent of the business who have considered the use of mobile friendly tools and platform like CRM integrated into their .net CMS platforms drives desired business results. Likely, the enterprise who has selected the CRM integrated into their .net CMS, get an improved forecasting, safe transactions around the sales pipeline and customer analytics. Therefore, if you are trying better customer experience with your online business, consider the use of latest technologies such as CRM integrated into your asp.net CMS. It just not tracks down the behavior of your customers and allows taking action according to it, but making sure that you have the data to assess the needs of your future customers as well.